Secretary of State Mike Pompeo issued a declaration Thursday encouraging the global community to stand up for religious freedom. 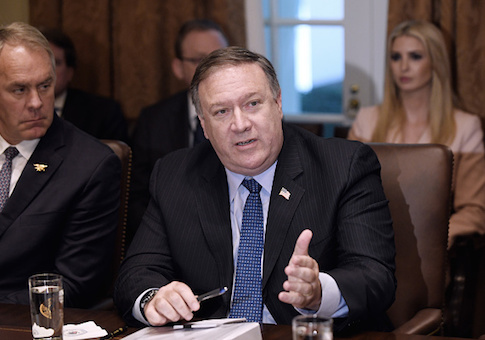 The release of the Potomac Declaration came after Pompeo first annoucened its pending release at the start of Thursday’s session of the Ministerial to Advance Religious Freedom. The declaration states "the freedom to seek the divine and act accordingly—including the right of an individual to act consistently with his or her conscience—is at the heart of the human experience," The Hill reported. Religious freedom is a "far-reaching, universal, and profound human right that all peoples and nations of good will must defend around the globe," it adds. Acknowledging current challenges to this freedom, the Declaration notes "persecution, repression, and discrimination on the basis of religion, belief, or non-belief are a daily reality for too many." The document points out religious freedom is closely intertwined with other freedoms. "Where religious freedom is protected, other freedoms – like freedom of expression, association, and peaceful assembly – also flourish. Protections for the free exercise of religion contribute directly to political freedom, economic development, and the rule of law." The declaration argues governments have a responsibility to protect religious freedom for all citizens, and they must grant equal protection under the law to everyone, "regardless of religious affiliation or lack thereof." It does not deny the right of states to have an official religion, but says this "should not impair religious freedom or foster discrimination towards adherents of other religions or non-believers." Religious freedom also should not be limited to private worship; rather, "believers can exercise this right alone or in community with others, and in public or private," according to the declaration. "The active enjoyment of freedom of religion or belief" includes "observance, prayer, practice, teaching, and other activities." The Ministerial to Advance Religious Freedom took place over the course of three days and brought together delegates from roughly 80 countries, as well as representatives from civil society organizations and religious leaders. During remarks he gave at the close of the ministerial, Pompeo said the State Department will host a three-day workshop in two months, which will "support and scale innovative public-private partnerships that promote and defend religious freedom around the world." He also said several partner countries would likely soon make announcements about follow-up conferences to tackle regional challenges to religious freedom. This entry was posted in Issues and tagged Mike Pompeo, Religious Freedom, State Department. Bookmark the permalink.